On August 14, 2018, the U.S. Mint announced the final design for the War in the Pacific National Historical Park quarters. The reverse shows American forces landing at Asan Bay. These troops strengthened the number available to fight for the liberation of Guam. The inscriptions on the coin’s reverse include the name and location of the site: war in the pacific, guam, the year of issue: 2019, and the motto: e pluribus unum. 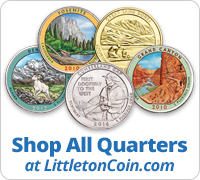 This handsome quarter is a perfect match for the 2009 D.C. and U.S. Territories quarter, which also featured Guam, the park’s location. As the 48th in the series overall, the War in the Pacific National Historical Park quarter will be followed by a design honoring San Antonio Missions National Historical Park in Texas. Just days after the bombing of Pearl Harbor, Japanese forces seized the U.S.-held Pacific island of Guam. It remained a strategic military point throughout World War II, until American forces reclaimed the island in 1944. Today, a total of seven sites around the island make up this National Historical Park. These areas stand together as a beautiful way to honor all those who served during the Battle of Guam. Those who visit the park are able to enjoy a variety of outdoor activities such as snorkeling, fishing and hiking. Learn more about War in the Pacific National Historical Park. On August 14, 2018, the U.S. Mint announced the final design for the American Memorial Park quarters. The reverse shows an indigenous woman looking out at the Flag Circle and Court of Honor. The inscriptions on the coin’s reverse include the name and location of the site: american memorial park, nor. mariana isl., the year of issue: 2019, and the motto: e pluribus unum. This handsome quarter is a perfect match for the 2009 D.C. and U.S. Territories quarter, which also featured Northern Mariana Islands, the park’s location. As the 47th in the series overall, the American Memorial Park quarter will be followed by a design honoring Guam’s War in the Pacific National Historical Park.